Vornamen + Wunschfarbe der Herzanhänger? Now also in anthracite-hand painted-and labeled and lacquered. Aufhängekordel and Karoschleiferl are of course included in the price. Size of the shield approx. h 14.0 x W 30 cm. We can mount up to a maximum of 5 hearts next to each other. These are included in the price. 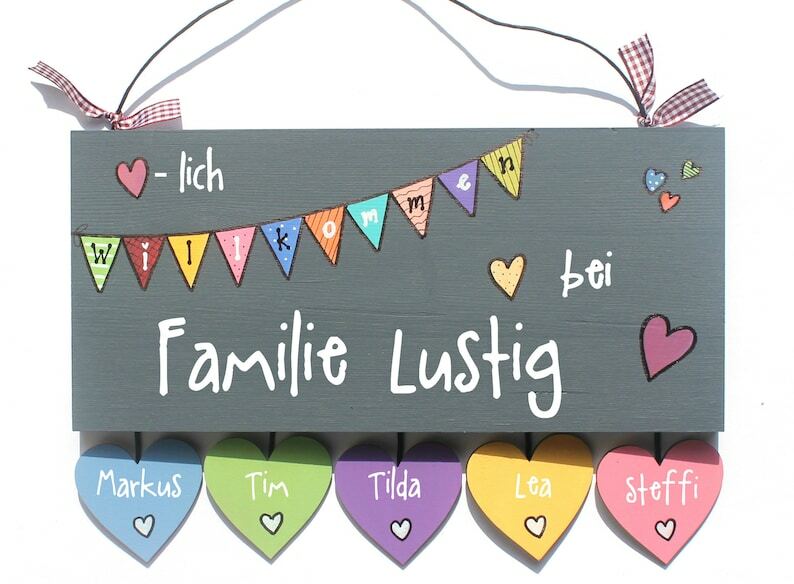 Selection of the fonts and Herzchenfarbkarte can be found in the product images. Label above as shown with the pennant, including your desired name. We would also be happy to provide "placeholder hearts" if the family planning is not yet complete. These placeholders can then be easily replaced later. Additional hearts can be found in our shop section "Accessories".